Have you ever thought about how much plastic we use? And where it ends up? Plastic seems to have become a necessity in our lives. Many of us have discontinued using single use plastic bottles and carry cloth bags to the grocery store. Unfortunately, this is only a start. As I write this, I look at all the plastic shtuff around my desk and all the plastic kayaks on our kayak rack. Plastic seems to have become a necessary evil in our lives today, but I think that we need to start decreasing our dependence of it and be more conscientious of recycling and proper disposal. Any thoughts or ideas? Please share, discuss, ect. Let's work together to increase awareness and start working toward solutions!!! 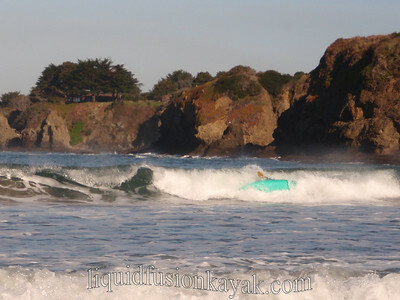 Excitement over the south swell this weekend was pretty well nixed by strong northwest winds. What's a girl to do? Rather than fight the wind and get bounced around at sea - I ran for the hills. Actually I didn't run - I pedaled. Over the past 4 years, small business ownership and lots of time on the water has greatly decreased my time in the saddle. It is hard to maintain a balance between my water and land passions - especially since I make a living on the water. 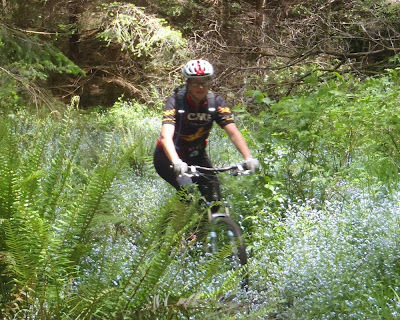 This spring, I started to get into a regular riding groove and think that I may be on track to finding balance. 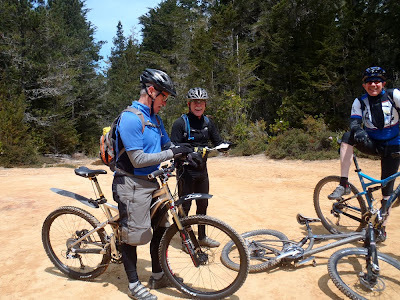 This weekend, I connected with a local group of the Mendocino Coast Cyclists to ride the trails in the Caspar watershed area of Jackson State Forest. 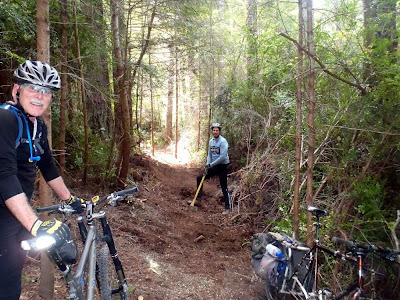 It was fun to ride and catch up on goings on - NEW Trails, Mendocino Coast Fat Tire Festival, trail work parties, bike lust and component envy. 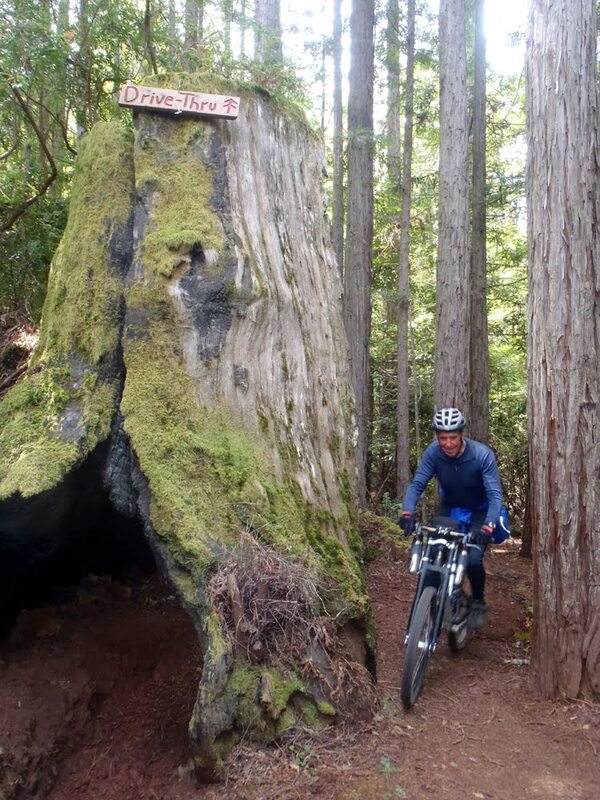 The local riders are putting on a Mendocino Coast Fat Tire Festival this fall. 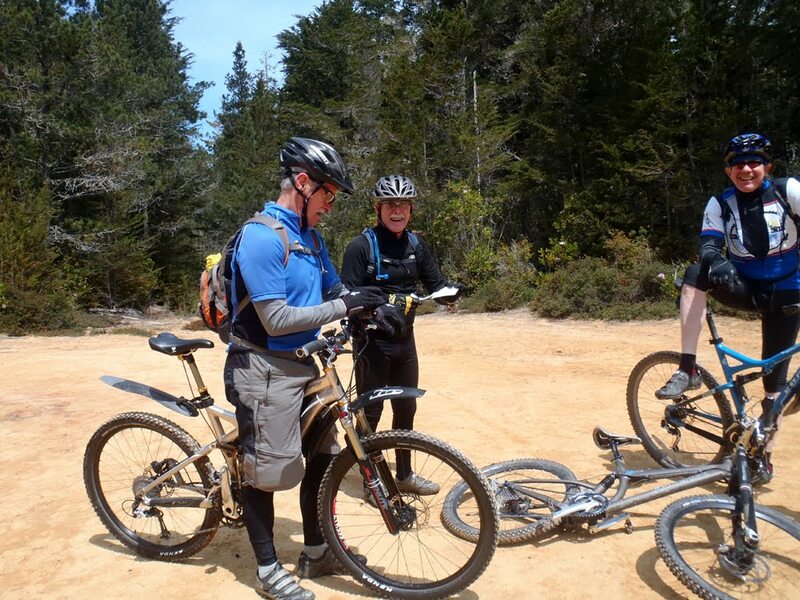 In preparation for the festival, Jack and Roo are working on mapping the mountain bike trails. They hope to have a guide book out in the fall for the festival. As we are riding, we come across one our local riders/trail builders doing some trail maintenance. He was building a bypass around a section of trail to decrease erosion. Cheers Jesse and all the other trail builders and maintainers for all of your hard work!!! Traction was perfect. The couple of inches of rain that we had during the week soaked in and settled the dust. A couple of spots were a little sticky like the bottom of our ride-thru tree (which I guess by the new sign is called Drive-Thru). 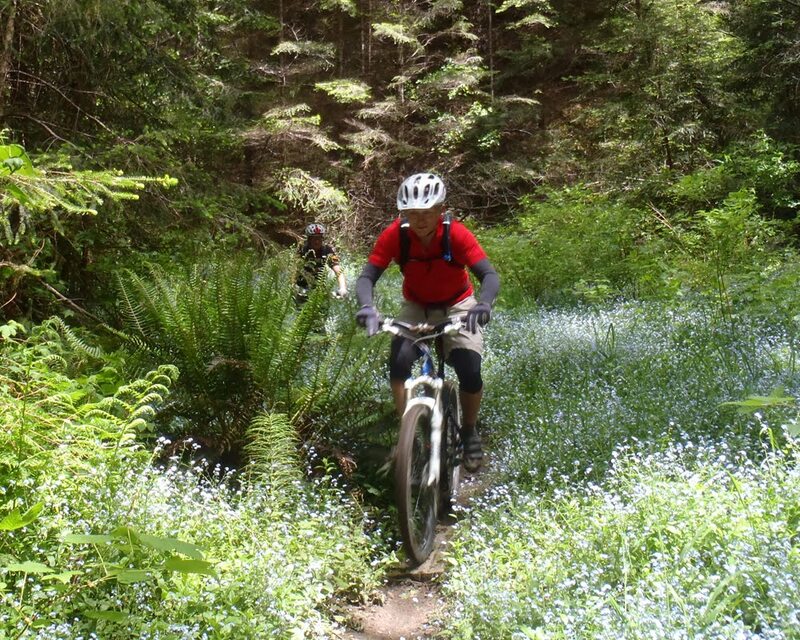 Spring is a great time of year to ride. The birds are singing, the creeks are babbling, and the wildflowers are blooming. 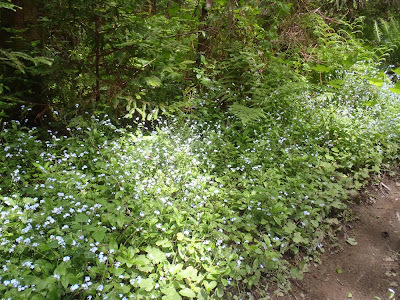 I had to get some photos of the carpet of blue forget me nots lining the trail by Jughandle Creek. And of Amy sporting an North Coast Brewing Company - a reminder that not only do we have great mt biking but fresh, tasty local beer. I wonder if they have an Old Rasputin Jersey? 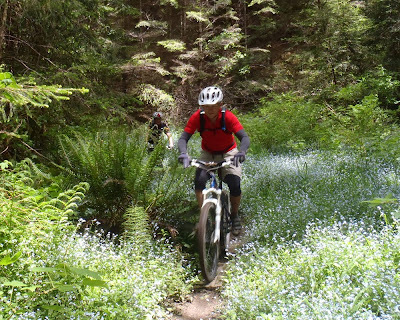 It isn't hard to get motivated about riding on the Mendocino Coast with an AWESOME network of single track trails in a coniferous rain forest and a great bunch of riders to share it with. What does the Laundry Say? But what does it really say? On those weeks when the pile is high it says - "You've been playing hard and neglecting your dirty wash."
Salty polypro tops attest to some quality time upside down in the ocean - perhaps a surf or rock gardening session. Mud splattered bike tights say - "Those mud puddles on the trail sure were fun!" While dusty socks say, "Gee it hasn't rained in a while." Trunks and uv tops that are spattered with sunscreen attest to some warm sunny days of flat water paddling. Carhardts always tell a tale of the latest project - "painting the bedroom green, eh?" or "need to add a little more compost to your soil." Wool socks - "We will keep your tootsie's warm just remember to line dry." And those dirty sheets - no comment from them - just a grin. So from now on - don't curse the pile of dirty clothes in the hamper. Admire the fine adventures from the week. Sometimes you DO IT . . .
You get into the zone and JUST DO IT . . .
We didn't get much whitewater river kayaking in this winter, but somehow I stepped up my game from being a schizophrenic class II/III boater to confidently paddling some class IV. I'm not sure how this really happened but suspect that it had a lot to do with the time that we spent this winter in the surf zone. 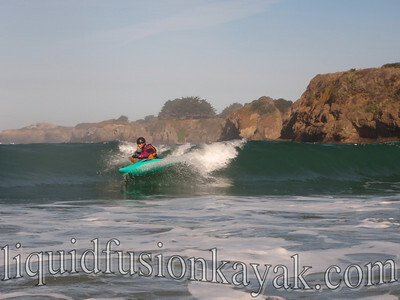 Capsizing in the surf zone when you are kayak surfing is inevitable and even a good strategy so needless to say a winter of kayak surfing meant lots of time upside-down and rolling in moving water. 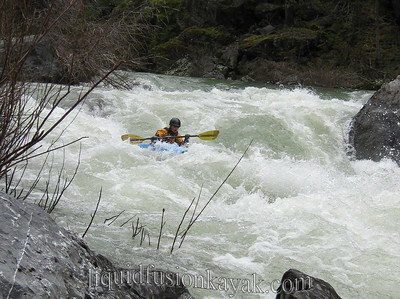 When I started whitewater kayaking, my main goal was to remain upright. I was terrified of flipping and being flushed down a rapid upside down. Through experience, I have come to realize that a capsize and roll only takes seconds and that you don't end up way downstream in the process. It is almost like time stands still and you roll up in almost the same spot where you capsized. The key is confidence in your roll. 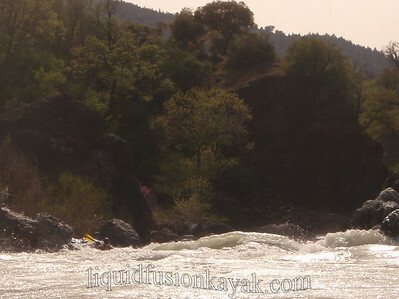 So this whitewater season, I surrendered myself to the inevitability of capsizing on the river. My mantra shifted from take the easy line and stay up-right to see your line and execute it. If things go to ! @#$ - roll up and paddle to safe water. 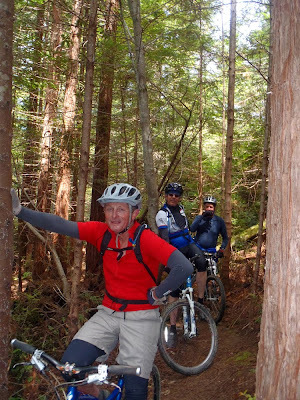 On our Eel River Mountains to the Sea Paddle last month, We encountered a couple of stretches of Class IV. 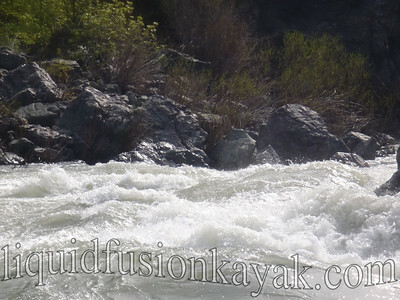 Our last paddle of the trip was on the Middle Fork of the Eel River at 3500cfs. 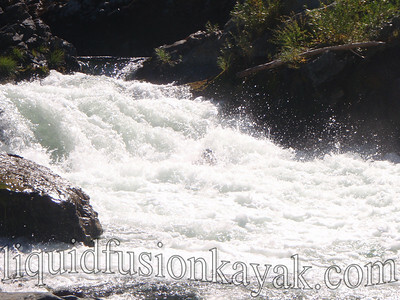 The run was 25 miles of class II and then probably the hardest rapid that I have run yet in the class IV range. We scouted the rapid and the middle looked downright ugly. It had 2 consecutive but slightly offset recirculating hydraulics - DEFINITELY not a place to be. Neither the left or right had a clear path but the left looked like the best route to take and not end up in the messy middle. Of course the left had 2 considerable hydraulics to be negotiated. The plan was to avoid the first and punch the other one (most likely capsize, flush-out, and roll-up) and enjoy the wave train finish. Of course, I capsized on the entrance drop into the rapid - rolled up and eddied out. THUMP, THUMP, THUMP - I felt my heart beating through my chest. The thought "I could get out here and portage," shot through my mind. I erased the thought and told myself to charge it. I ferried midway across but should have ferried further to the left. When I turned to head downstream, I was heading right at the hole on the top that the plan was to avoid. I didn't have time to avoid it and tried to drive through it. It grabbed me and flipped me. I rolled up and continued driving for my target rock on river left. I got there and somehow skirted the flush-out and roll up hydraulic. F - Yeah!!! It might have been nice to run the lines cleanly, and I am sure that someday I will. But there is definitely satisfaction in nailing a combat roll in a critical situation - not to mention nods of approval from paddling companions.